The memorial includes a canine statue and a marker of a Marine Corps Forces Special Operations Command (MARSOC) Multi-Purpose Canine (MPC) kennel named after Corporal David M. Sonka, a Marine dog handler who was killed in action. The bronze monument depicts a life-size Belgian Malinois in a sitting position, wearing his full deployment kit with ears perked, appearing ready to spring into action. The statue honors fallen MPC Flex and all military dogs that serve and protect. 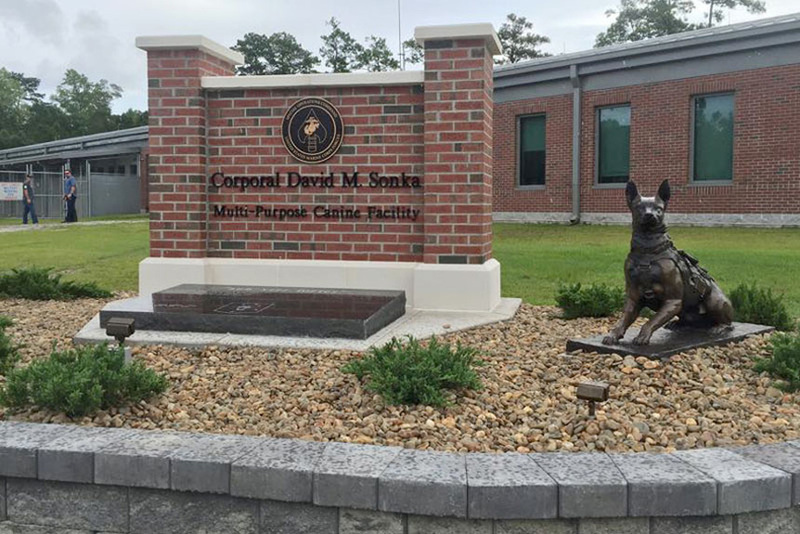 It stands to the right of the brick and stone marker designating the Corporal David M. Sonka Multi-Purpose Canine Facility. Lying flat in front of the sign is a black stone maker listing five Marines and two canines killed in military operations in Afghanistan. Across the top of the marker is “sub viri fortes,” meaning “the brave.” Near the bottom center is the symbol for Marine Corps Special Operations Command. 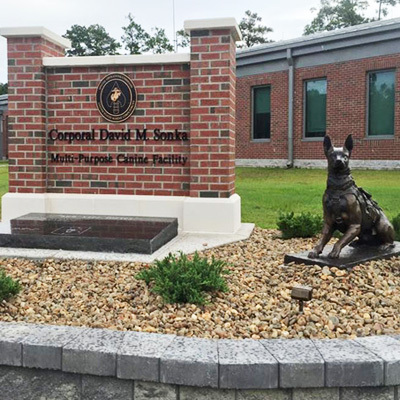 The statue was commissioned for and dedicated along with the Multi-Purpose Canine kennel at Camp Lejeune Marine Base being renamed in honor of Corporal David M. Sonka. Sonka was killed along with Marine Staff Sgt. Eric D. Christian on May 4, 2013 while conducting combat operations in Farah province, Afghanistan. Sonka’s working dog, Belgian Malinois Flex, was also killed in the attack, reportedly in an attempt to save the Marines. Tory Sonka remembered her late husband’s love for the Marine Corps and his work as a dog handler. “His dream was to be a dog handler and he was doing exactly what he wanted to be doing,” she said following the dedication ceremony at Stone Bay. Master Sculptor Lena Toritch, a native of St. Petersburg, Russia, has created several Military K9 Statues for different branches of the US Military including one at the Airborne and Special Operations in Fayetteville, NC. She has also sculpted K9 statues for law enforcement agencies across the country. Corporal David M. Sonka was a multi-purpose canine handler assigned to 2nd Marine Special Operations Battalion. The canines used by Sonka and MARSOC have three primary tasks of explosives and human odor detection; man tracking and trailing; and protection for the handler and teammates. Sonka was on his second deployment in support of Operation Enduring Freedom when killed. The memorial is located in the Stone Bay area of Camp Lejeune, NC. The memorial stands in front yard of the kennel facility.